Vitamin E, also known as Tocopherol or alpha-Tocopherol, is one of the fat soluble vitamins that are important in the body. The most active form of vitamin E in the body is alpha-Tocopherol. For both men and women 19-years old and older, the recommended intake of vitamin E everyday is 15 mg.
Vitamin E, specifically alpha-Tocopherol, primarily acts as an antioxidant in the body. It scavenges for harmful free radicals that causes damage to the cells. Free radicals cause certain cancers and cardiovascular diseases. Although alpha-Tocopherol is an antioxidant, there has not been solid proof that it contributes significantly to the prevention of heart diseases. 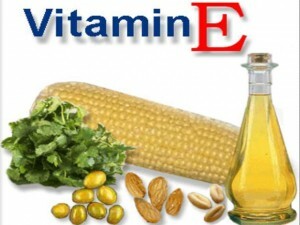 Vitamin E helps in DNA repair and it also helps strengthen the body’s immune system. Vitamin E helps keep skin healthy, as well as protect the eyes from diseases. It helps keep moisture in and prevents the skin and lips from becoming dry, itchy or chapped. It helps prevent pancreatic disorders and diabetes. It has been suggested that vitamin E helps prevent the development of Alzheimer’s disease. It has been suggested that vitamin E can prevent osteoarthritis. It can also help relieve osteoarthritic flares. It is said that the effect of this vitamin is more or less the same as that of non-steroidal anti-inflammatory medications (NSAIDs). Vitamin E has been said to improve mobility in the joints, thus preventing the development of gout and the accumulation of waste in those areas of the body. Because the body is unable to produce this vitamin, it needs to be taken in from food sources. Vitamin E is abundant in vegetable oils. Margarine and salad dressings are a good source of this vitamin. Whole grains, vegetables (the green and leafy ones), beans and nuts are also good sources for vitamin E.
Experts advise not to take in more than 1,500 IU of vitamin E everyday. This is because vitamin E has anticoagulant properties and can increase the body’s risk for bleeding. It is also advised to not take vitamin E supplements for people who are currently taking drugs for anti-blood clotting, like aspirin or warfarin. Previous studies conducted have also suggested that taking in vitamin E supplements increases the risk of the recurrence of cancer in people who suffered from neck and head cancer. This research conclusion cautions people to get their daily vitamin E supply from natural food sources rather than from supplements. Just make sure you take D-ALPHA tocopherol and NOT DL-alpha tocopherol. The DL is synthetic….not good!